I must admit that I see no future in a kite based generating system. Yes the energy is up there and it is happily exploited from time to time by miles high convection cells called thunderstorms. The idea of a million dollar chunk of hardware been fed into that is not attractive. 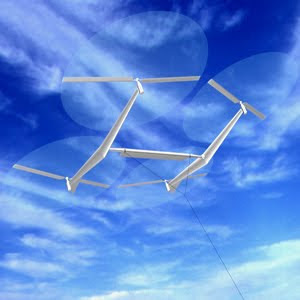 So a lot of that wind energy needs to be consumed flying the kite into high altitudes that are possibly quiescent. This while supporting the dead weight of the tether. What is more, there is no way to haul it down and land it conveniently at the local airfield. What are these guys thinking? The only fix that I can see to the design concept is to add another tether on this sucker and attach super balloons that somehow find a quiet spot above this contraption. Anyway they found some money and some folks do have the fever and some of the design ideas even look interesting. This song will not end until a few of these devices crash spectacularly. Somehow the idea of a large power generator flying aloft over my head is not reassuring no matter how lightly built. That begs a very big question. Where do you put these suckers if you actually have a system that you trust to perform? There is no way to secure point of impact if something goes wrong. I am trying to be generous here but I admit to difficulties. I also am not certain that problems might abate as the device is scaled up as has happened in most other energy technologies. After all the wind turbine business took off once the larger sizes were available and that would also be true for tidal power. Anyway, let us wish them luck and hope that they can surprise. Popular Science's most recent magazine (on newstands Sept ,2009) has a brief two paragraphs which indicate that Kitegen is building a 3 megawatt system with 1500 square foot kite sail. This is scheduled to be completed in 2011. This is 75 times larger power than a 40 kilowatt demo system that was produced. Here is a 39 page presentation from May 2009 by Mario Milanese on Kitegen. The winds in high-altitude jet streams hold roughly 100 times more energy than all the electricity being consumed on Earth, according to a study by Stanford environmental and climate scientists Cristina Archer and Ken Caldeira.